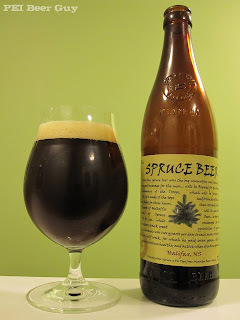 The colour of this old-style Garrison Spruce Beer is a dark, chestnut brown with a reddish tint. It pours with an off-white head that is about 1.5 - 2 fingers high. It ends up being a thin ring of smooth, fine-bubbled head with no lacing that sticks. The aroma of this is of spruce and fir needles, as well as wet wood/branches... you know that smell when you pull a Christmas tree out of its stand? That's it. There is also some strong molasses / malt aromas - even something like gingerbread (which is probably just an offshoot of the molasses). There is also somewhat of an earthy, "roasted sap" quality to it. The taste? It tastes like I ate a liquefied Christmas tree. Memories of cough syrup surface. Just take the above aroma descriptors, liquefy it, and drink it... in the woods. That's what it tastes like. Like drinkable, spruce-flavoured, medicinal beer. It is, as something meant to be easily enjoyed, much too strong. It is authentic, though, I bet, and very memorable... just not easily enjoyable. This one must be done in sips. The carbonation is nice... bright, but not aggressive. The mouthfeel is somewhere on the light side of medium, with a bit of a slick finish. It's not very bitter at all... more sweet. If Garrison does one of these every year, one a year would be good, but no more. It's a unique, memorable, seasonal sipper, but it wouldn't be something I'd want any other time of year. Big thanks to Chris for finding me this one (since it sold out within two days). He said drinking it was like kissing a Christmas tree - I just didn't expect it to be a French kiss.